Lifetime is dedicating time this Mother's Day weekend to shine the spotlight on some of the great mothers throughout history by premiering The Real MVP: The Wanda Durant Story . The title comes from a moment from Kevin Durant's 2014 MVP speech in which he thanked the person who he felt was the most deserving of praise that evening. 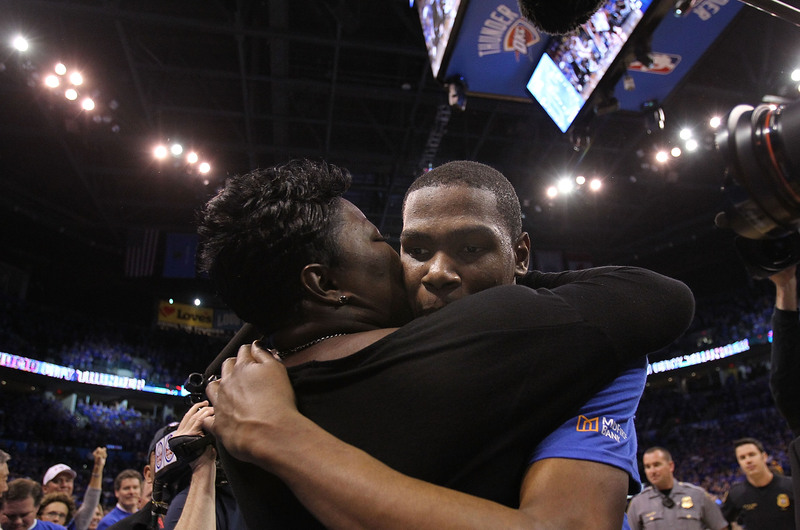 After talking about how much trouble his mother went to raise him and how he truly started from the bottom, Durant said that his mother was "the real MVP" to monstrous applause. The phrase "The Real MVP" has become a popular internet meme since the speech, but the Lifetime original movie hopes to place the focus back on who the quote was directed towards in the first place — Wanda Durant. The Real MVP: The Wanda Durant Story opens with footage from that very speech, but it's far from the only heartwarming moment in the speech. Durant spends the speech talking about his mentors, his friends, and more than anyone else in his world, Durant talks about his mother. While Durant's love of his mother is extremely powerful, it took a lot of work to go from being a kid from a broken home in Washington D.C. to becoming the NBA MVP. Here are some heartwarming moments from Durant's MVP speech that should help inspire anyone to strive for greatness. "We moved so many different places growing up. It felt like a box. It felt like there was no gettin' out." Anyone who has ever felt trapped in life can relate to this, but it shows that anyone can feel this way and then rise up and become free to make their own future. "I fell so many times and got back up." Durant may have become an MVP in 2014, but it took a lot of practice and a lot of failure to get there. He never quit, though. He always got back up. "There's never a point where you can stop getting better." Durant may be an MVP, but he knows that he can still improve and that his work is far from over yet. "We're all a work in progress as men, and you still love us and I thank you, [Oklahoma City], so much for embracing us." It's always best to look to those around you for support. You're more likely to find comfort in those that have helped you build toward becoming a better person than with anyone else. "And last, my mom. I don't think you know what you did." It's so hard to communicate just how much a good mother can mean to someone. The guidance, love, and support that Durant feels appear to be so overwhelming that he can't comprehend anyone else fully understanding it. If you're watching the speech, this is the point where you're going to want to get those tissues. "Everybody told us we weren't supposed to be there." Wanda Durant was raising two kids by the time she was 21 years old, and she fought against everything that society told her to be and fought to raised her children the way she saw fit. "One of the best memories I had is when we moved into our first apartment — no bed, no furniture, and we just all sat in the living room and just hugged each other. We thought we made it." Everyone gets to decide their own definition for success. When he was young, Durant had thought that just having a place to sleep that was his own was what it meant to "make it." Although his success has brought him levels of fame and fortune he never comprehended, he still remembers where he came from and who helped him through it all — his mother. "When you didn't eat, you made sure we ate. You went to sleep hungry. You sacrificed for us." Durant nearly losing his ability to keep composure as he reaches the most emotional part of his speech is telling, as the love he has for his mother is immense. It shows that sometimes when you struggle to help give someone a better life, that it all pays off in the end. From everything that Durant says about his mother, it's clear that she was the one who won that night. The whole speech is emotional, humble, and not the kind of speech you would typically expect from a sports superstar. Durant spends only some time talking about himself but dedicates the majority of the speech to those who inspired him and those who helped him get to where he is today. The whole speech can be watched on the official NBA website, and those wishing to see a clearer picture of how Wanda Durant left such an impact on her son's life can tune into The Real MVP: The Wanda Durant Story on May 7 at 8 p.m. ET on Lifetime.